I love grapefruit! But I've always just sprinkled a bit of granulated sugar on top and had at it. Alton explains that in doing this, you're just covering up the bitter fruit with sugar and not actually changing the flavor profile at all. He suggests broiling it and then topping it off with a pinch of salt. I won't go into the science behind it, (for that you can watch the episode), but the salt works to bring everything together into one sweet juicy grapefruity mess. - Turn on your broiler. 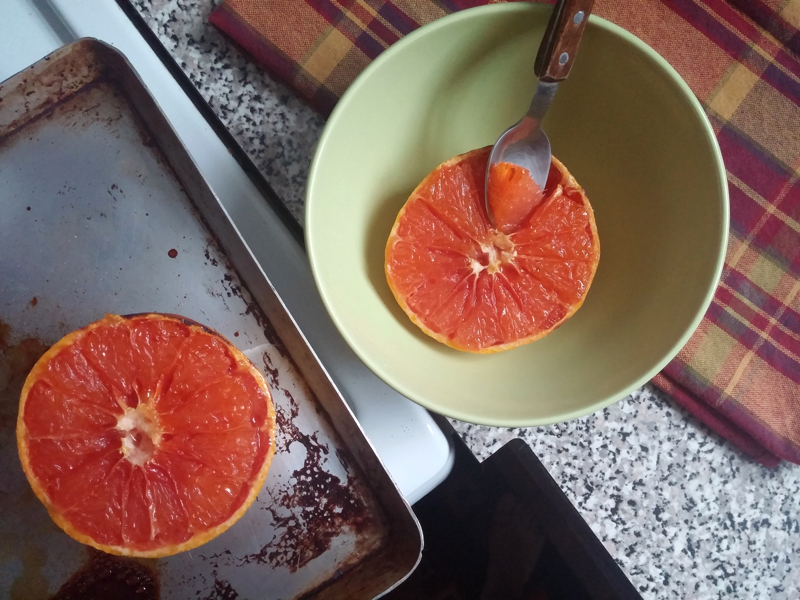 - Slice the grapefruit in half, then use a paring knife to cut around it and between the segments. - Sprinkle the sugar atop each half, making sure to cover the fruit evenly. - Leave under the broiler until the sugar is melted and glossy, about 5 minutes. - Once out of the broiler, sprinkle a pinch of salt over each half, and enjoy! Try it! I'm never eating grapefruit without broiling it ever again! Oh that's funny, I just watched that as well! I've been liking his episodes, and want to try a few things myself. I've never been a fan of grapefruit because of it's bitterness, but I'll have to try this and see if I like it! I have a little grapefruit tree and have been wondering what the heck to do with the fruit whenever it's ready to make some. Haha. I usually put them on while I'm cooking or doing the dishes. That way I can watch them numerous times and not get bored with them, because I'm never fully paying attention to begin with! Do it! And it's neat that you have a grapefruit tree. I would eat the heck out of those!